The concept that Israel includes Palestinian land is simply not true. As Walid Shoebat has stated, “One day during the 1960s I went to bed a Jordanian Muslim, and when I woke up the next morning, I was informed that I was now a Palestinian Muslim, and that I was no longer a Jordanian Muslim.” Jordan was established to be the Palestinian state. The Palestinians were kicked out of Jordan after they attempted to overthrow its government. The Arab countries have kept them as refugees for generations in order to gin up anger against Israel with the hopes of driving the Jews into the sea. It is unbelievable that our college professors are encouraging this sort of behavior. It’s a shame our college teachers don’t know history. In actuality, the land occupied by Jordan was initially given to Israel. But refusing to throw its weight behind BDS isn’t enough, Secker (Jake Secker) warned. If the university doesn’t take further action to insulate its students from the political actions of their professors, he said, it could have a crisis on its hands. 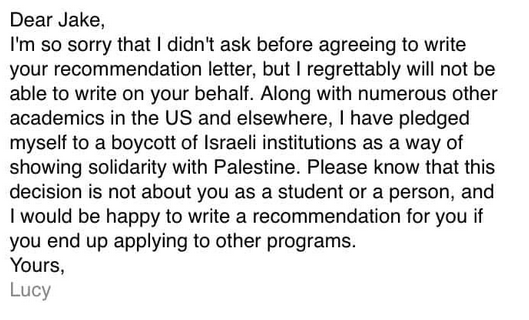 Any university discriminating against students who want to study in Israel should lose all federal and state funding. BDS is not an acceptable policy, and the government should not be funding it. Yesterday Townhall posted an article about the reporting of the violence on the Israeli border with Gaza. First of all, let’s look at some of the history of Gaza. In 2005, Israel turned over Gaza to Arabs who wanted a Palestinian state. The Arabs immediately destroyed the greenhouses that supported the Gaza economy and began using Gaza as a launching pad for missile attacks against Israel. In June 2007, Hamas took over Gaza. Hamas is designated as a terrorist organization by America. They have definitely lived up to their name. Let’s add a few facts to this just to make it interesting. News outlets reported that the ‘protestors’ set tires on fire, sending plumes of black smoke into the air, and hurled firebombs and stones toward Israeli troops across the border. Doesn’t sound like a peaceful protest to me. It was also noted that at least three people were killed because they were about the detonate a bomb. This sounds like self defense to me, but it is not being reported that way. The media’s biased reporting on Israel is nothing new. It has been a staple of liberal media reporting. Anti-Israel bias is also rampant amongst Democrat politicians. Even some liberals cannot understand it, calling it a double-standard. Howard Kurtz uses some very appropriate terminology when he discusses the media’s double-standard on Trump reporting in his new book Media Madness, calling the media’s biased reporting a “decimation of original reporting.” “The lines between news and opinion were not just blurred, they were all but obliterated,” Kurtz writes. That exact bias is all too familiar in the reporting of Israeli defense against Palestinian violence. Just as mainstream media has been irresponsibly spreading fake news about Trump, so too have they been spreading lies about Israel – vilifying Israel and victimizing Palestinian aggression. If you would like unbiased insight into the Israeli-Palestinian conflict, I suggest you read analysis by self-proclaimed left-wing Arab, Fred Maroun. But until the media stops with the fake news, take heed what you read. Israel is a small postage stamp in a football field of Arab nations. It is truly sad that the Arab nations will not let them live in peace. It would be nice if Israel and a new nation (historically it has never been a nation) of Palestine could live side-by-side. However, that is highly unlikely unless things change drastically. One problem is what the Palestinians are teaching their children. Below is a picture of Palestinian kindergarten children dressed as suicide bombers. They are being taught that it is noble to die in the act of killing Jews. That might be a problem if you want peace. Another problem is that the families of terrorists are generously paid for the terrorist acts of family members. CBN has posted the following information along with a petition to Congress to sign the Taylor Force Act. Free monthly stipend—ALL courtesy of U.S. tax dollars. This practice of financially incentivized murder is known as #PayToSlay. We must stop it. That adds up to more than $300 million to reward and incentivize acts of murder—in one year alone. has terminated payments for acts of terrorism against U.S. and Israeli citizens to any individual who has been convicted and imprisoned for such acts, to any individual who died committing such acts, and to family members of such an individual. To put it bluntly, unless the American people make noise, this bill will die in committee in the Senate. It is about time that America stopped funding to families of terrorists who kill Israelis. The New York Post is reporting today that the State Department has announced that America with be withdrawing from UNESCO (United Nations Educational, Scientific and Cultural Organization) because of UNESCO’s anti-Israel bias. This is long overdue. In June 2012, I posted an article illustrating how some of UNESCO’s money is spent. The article featured a cartoon teaching Palestinian children that Jews are killing them. That is not a recipe for peace. But the Israel-Palestinian issue has been a major point of contention. Last year, Israel removed its UNESCO ambassador after the agnecy stated that one of Jerusalem’s holy sites is specifically a “Muslim holy site of worship,” according to Reuters. Senior American officials, including UN Ambassador Nikki Haley, have repeatedly denounced UNESCO, which the US also withdrew from during the Cold War under then-President Reagan. Washington, which viewed the agency as mismanaged and used for political reasons, rejoined it in 2003. Until the people who now live in the Gaza Strip do something other than to send rockets into Israel, I see no reason to recognize Palestine as a nation. The world does not need another terrorist state. In recent years we have seen rockets from the Gaza Strip aimed at civilian targets in Israel and tunnels dug to facilitate attacks on Israeli children. Western countries have funded these activities in the name of humanitarian aid. Unfortunately, very little of the humanitarian aid has gone to humans–it has been used to buy weapons and create tunnels to attack Israel. If the United Nations continues to support these activities, we will have no choice but to withdraw from the United Nations completely. Taylor Force was an American who was stabbed to death in 2016 while visiting Israel. He was a former U.S. Army officer who was part of a Vanderbilt University tour group visiting the country. 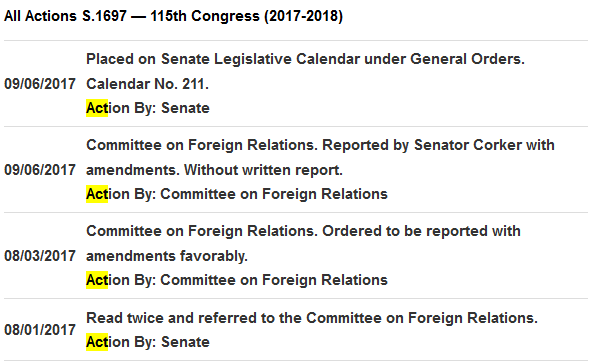 On September 28th of last year, Mr. Graham (for himself, Mr. Coats, Mr. Blunt, Mr. Rubio, Mr. Kirk, Mr. Cotton, Mr. Boozman, Mr. Cruz, and Mr. Scott) introduced the following bill; which was read twice and referred to the Committee on Foreign Relations (S. 3414). The Senate Bill and the House Bill are the same. So what is this about? Since September of 2015, the beginning of the so-called “stabbing intifada,” Palestinian terrorists have murdered more than 50 innocent people and wounded hundreds more. The media often describes these terrorists as “lone wolves” completely disconnected from Mahmoud Abbas and his Palestinian Authority (PA). But the fact is that the Palestinian Authority makes generous lifetime payments to every Palestinian imprisoned for killing Israelis. And if the terrorist dies during his attack, his family receives these payments. This financial support for terrorism is actually required under legislation passed by the Palestinian legislature. The United States provides the PA with approximately $300 million in aid each year. The PA makes approximately $300 million in payments to terrorists and their families every year. There is no way around this troubling reality: our taxpayer dollars are being used to fund terrorism. This must end! Sen. Lindsey Graham re-introduced a critical piece of legislation — The Taylor Force Act. Representatives Lamborn and Zeldin introduced similar legislation in the House of Representatives. This bill requires that we cut all U.S. aid to the PA until it stops funding terrorism. 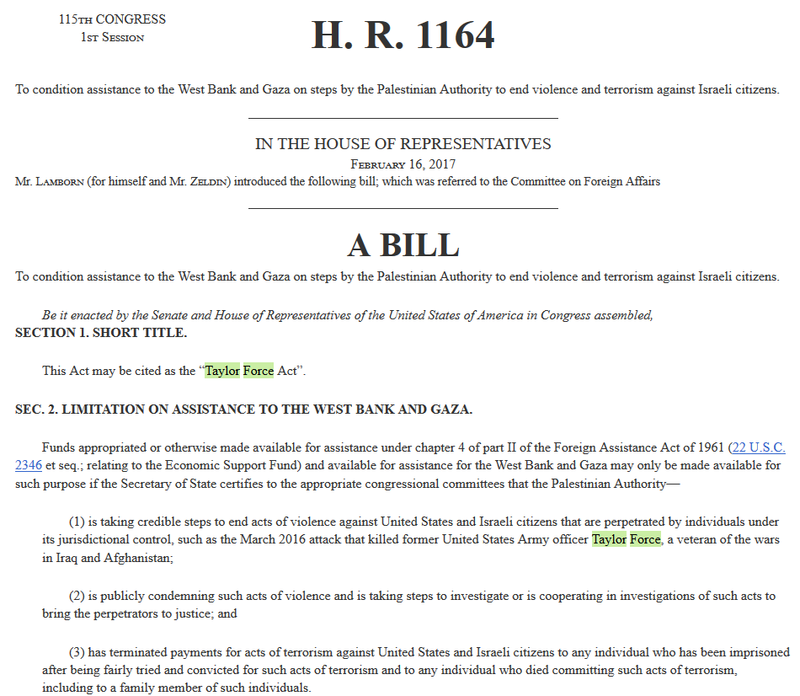 This bill is named after Taylor Force, a West Point graduate who survived tours of duty in Iraq and Afghanistan only to be murdered in Israel by a Palestinian terrorist. The Tel Aviv-based Shurat HaDin-Israel Law Center, representing 24 Americans living in Israel, filed a civil action lawsuit against the State Department last November claiming that the U.S. government is funding Palestinian terrorism in the West Bank and Gaza. The plaintiffs, some of whom have been victims of Palestinian terrorism, “are fearful that the money that is going to the Palestinian Authority eventually winds up in the hands of the terrorist organizations that can be facilitated to carry out attacks against them,” Nitsana Darshan-Leitner, the director of the Shurat HaDin Israel Law Center and one of the lawyers on the case, told The Daily Caller. “So they find themselves in a very weird situation where their tax money is going actually to attacks against them,” she added. The Obama administration, not surprisingly, has filed a motion to dismiss the lawsuit. It argued that the plaintiffs do not have legal standing to bring the suit – i.e., they did not suffer direct personal injury traceable to the actions alleged to be illegal. The Obama administration also argued that the courts have no business getting involved in foreign policy decisions that are inherently “political questions.” These are nothing more than pretextual arguments to prevent discovery of the truth whether the Obama administration is violating express congressional conditions on the granting of aid to the Palestinian Authority and for the West Bank and Gaza. American foreign aid has been funding terrorism for a while. It will be interesting to watch the fate of the House and Senate bills that are trying to end this practice. Yahoo News is reporting today that the UN Security postponed a vote on a draft resolution demanding that Israel halt its settlement activities as President-elect Donald Trump weighed in and said the United States should veto the measure. I would like to say a few things about the two-state peace solution. Israel dragged its citizens out of the Gaza Strip in 2005 and gave the land to the Palestinians (there actually are no Palestinians–that term was invented after the six day war. As Walid Shoebat stated, “One day during the 1960s I went to bed a Jordanian Muslim, and when I woke up the next morning, I was informed that I was now a Palestinian Muslim, and that I was no longer a Jordanian Muslim.”). At the time it was turned over, the Gaza Strip had greenhouses and infrastructure that supported its citizens economically. The new residents promptly destroyed those greenhouses–taking away their route to prosperity. They then used money given to them by generous (but mislead) countries to buy rockets to lob into Israel. Why in the world should we create another terrorist state? It is obvious that those claiming to be Palestinians have no intentions of making peace with Israel–the charter of the PLO states that Israel has no right to exist. It is time to ask the other Arabs in the Middle East to set aside some of their large acreage of land for the Palestinians. However, that will never happen because the Palestinians are useful tools in the fight to destroy Israel. President-elect Trump has promised to support Israel. I believe that will be a blessing to Israel and to America. Israel has been our only true friend in the Middle East. The United Nations is not a friend of Israel. It never has been. That was recently admitted by United Nations Secretary-General Ban Ki-moon (story here). We really need to look at the direction the U.N. has taken in recent years and think about whether or not we choose to be part of it.